TOP TEN THINGS I LOVE ABOUT BEAUTY & BUTTER - I Blog, Therefore I Am. My parents and I went to SMX Convention Center last Saturday for an expo. We were so tired from all the walking so we decided to treat and relax ourselves at Beauty & Butter, a new pampering destination for nails, face and body, at nearby SM Mall of Asia. It's a good thing that we tried Beauty & Butter. I honestly fell instantly in love with the place. I've been to a lot of pampering spa and salon shops and there's nothing quite like it. I had Foot Spa with Pedicure and my parents had Anti-Aging Facials which is creatively called "Those Were The Days". It was supposed to be just my mom and I but my dad also went along with us. To make it easy for you, dear blog readers, I listed down the top reasons why I love Beauty & Butter and why you should also check it out for yourselves. 1. Funky, retro and all that stuff. I like the store concept behind Beauty & Butter. It's a very young, vibrant and retro place without being tacky. The marketing geniuses behind the store splendidly developed a fun place where one is easily relieved and relaxed just by entering it. It's a very well-thought of creative salon down to the naming convention of the services offered (eg. "Striptease" for wax services and "Baby Calm Down" for facial for sensitive skin). I am one of those nit-picky people who wants good ambiance, upholstery and design on my pampering places. I can easily tell if a shop will provide good service just by looking at the interiors. Beauty & Butter definitely scored 5 stars on this one. I love the yellow and black design combination, the colorful treatment chairs, the lighting, the glass stickers in the entrance, the counters, even the foot sinks! In line with the "butter" theme, the ladies who work in the store are called Buttercups and Butterflies. I find them all nice, helpful and well-trained. The Butterfly (Receptionist) helped us a lot in getting the right service for our needs, and she explained to us what to expect during the treatments. The Buttercups in cute yellow outfits are the "salon masters". They ensured that we are all well-pampered with the services we availed. My Buttercup, Loida, was skillful and has very gentle hands. I also appreciated that she explained to me all the creams she lathered on my foot and the things she did on my foot spa and pedicure. It's always nice to know the benefits of these products and procedures to your wellness and "beautification". I love foot spa and pedicures but its been months since the last time I had any foot pampering treat for myself because of busy work schedule. Beauty & Butter's foot spa, also called "Footsie", is one of the best I had of late. It has the usual cleansing, exfoliation, scrub and massage; but what I love about it was the heal therapy cream that was applied followed by a hot wrap. My feet were refreshed and thoroughly relaxed by the whole experience. Nail polish colors from B&B. So many to choose from! I chose light beige. I love simple neutral colors for my toes. Beauty & Butter guarantees that all of their equipment and pampering tools are well-sanitized and clean. Each Buttercup has their own set of cleaning and buffing tools for their clients. Entertainment was also in the minds of Beauty & Butter creators. They have two big wall-mounted TVs that continuously play girly and romantic comedy movies that we women love. This is absolutely one of my favorite added services and entertainment at Beauty & Butter. Spend at least Php 500.00 and they will lend you their new iPad. I borrowed it and had fun tweeting, replying to e-mails, and posting Facebook messages while being pampered. How cool is that? Beauty and Butter may have a very young feel and atmosphere but it's not very overwhelming for young professionals and the "old" set to go to. I brought my parents along with me and they enjoyed the place and treatments like I did. My mom even had an extra manicure service and bought a bunch of Beauty & Body products to take home for us. My dad, who's not used to facials, agreed to the extraction part of the facial even if he was so against it in the beginning. The place might be intended for teens and tweens but it's still good enough for the rest of us. One of the things I love about SM Mall of Asia is the abundance of salons, nail spas and other pampering places. One wing of the mall is full of these shops and I must say that I already tried a handful of them in various visits. One of the things that made Beauty & Butter stand out from the rest are the very affordable rates it has. 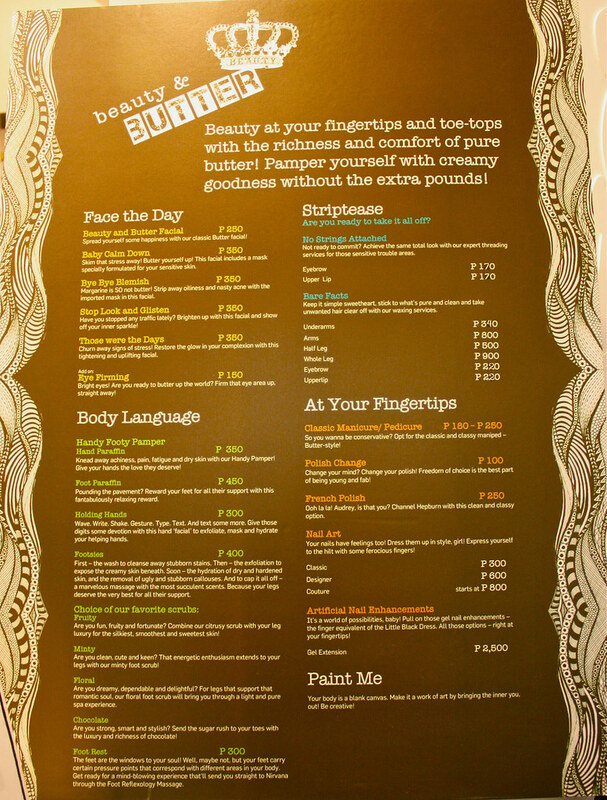 The foot spa and pedicure package was only Php 500.00 ($ 10.80), while the facials ranges from Php 250.00-350.00 ($ 5.40-7.50). I compared this from the other shops and salons in the area and I can say that it's the most inexpensive among the lot; but definitely the one with the best service. Offers, products and packages may come and go (may even be copied by other shops) but what will make one different is the sincerity of its customer service. The buttercups are very helpful to their clients and they ensure that everyone is pampered, relaxed and will get the satisfaction that they came for. They always have ready smiles and are patient with demanding customers like my dad (who even requested for a new movie to be shown while getting his facial). If the above is not yet enough to convince you to visit Beauty & Butter then this might be. They are having an iPod and iPad Raffle Promo from June 1 to December 8 this year. They have one winner each month of an iPod Nano and they will raffle an Apple iPad as grand prize in December. Raffle coupons will be given to clients who will spend Php 500.00 or above on Beauty & Butter services. Very neat! More Beauty & Butter photos on my Flickr site. beauty and BUTTER? sounds and feels yummy! thanks for posting, abbie. i'll try to go one of these days. that "footsie" looks enticing! i love this! i will visit them very soon! i am fan of anything to do with nails and pampering! thank you for posting this. love yah girl!